It is important to love how you look naturally, but there may be some parts of your appearance that you wish to enhance. For me, it is my face shape. I always want a more defined face, that V-shaped face (also known as瓜子臉) which is very much desired by many. That is why I recently did Botox for a slimmer face and more contoured jawline at Kowayo Aesthetic. I cannot deny that I have contemplated on invasive surgeries such as jaw reduction (aka shaving of jaw bone). BUT I am not gutsy enough and would not want something permanent. Who knows, I may regret one day? Most importantly, I have always been happy with my natural features, that I do not want to alter it for good, for life. That was why I rejected a sponsorship offer from a Korean plastic surgery clinic (though they offered any procedures I want) previously. 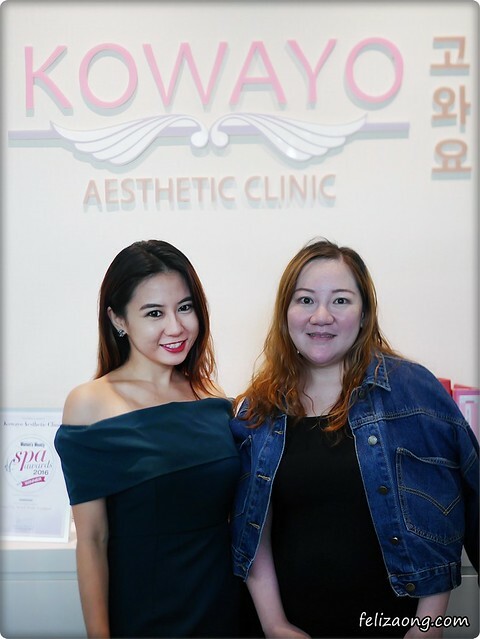 at Kowayo Aesthetic with Doctor Wong! The nurse then led me to the consultation room and I met with Dr Wong. I confided about my face shape concern. He examined my face and found that my masseter muscle was hard. It gets bigger by 'exercising' it via chewing food and teeth grinding, causing the face to look rounder and bigger. 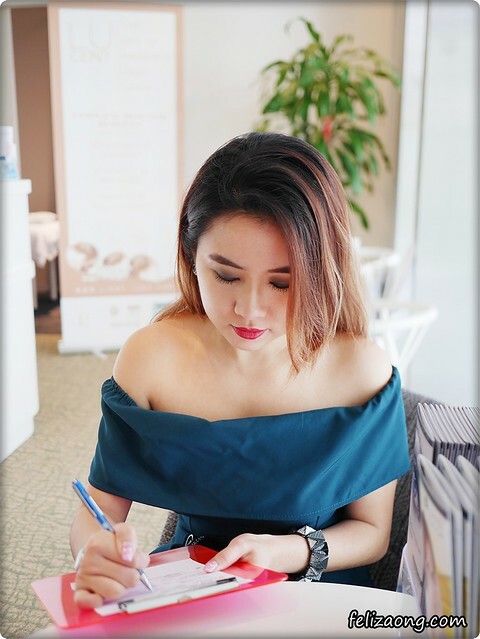 Dr Wong explained that a masseter botox treatment will soften/relax the muscle, and other suitable procedures to get the results I yearn for. - Nose Fillers: Gives a sharper midline of face (distinct nose bridge and tip), thus face looks slimmer. Before I was led into the treatment room, I was brought to take photos at varying angles. They are used for ‘Before and After’ comparisons, and yes, kept confidential. I never had needles poking into my face, unlike in the arms for blood tests and glucose drips. Of course, I was worried on the pain factor despite having a high threshold for it, but Dr Wong assured me. First, the nurse disinfected the skin and iced my jaw area for a minute or two. Next, Dr Wong instructed me to clench my teeth to feel the muscle… And then to relax after pin-pointing the exact spot to inject. Finally, he injected a few times into each side of my jaw. During the whole time, Dr Wong would check to see if I was feeling alright. The botox session happened so quickly (Less than 5 minutes), hassle-free, and with no numbing cream needed! No wonder Botox is known as one of those ‘Lunchtime Quick-Fixes’! The pain was very minimal. I continued with my appointments after leaving the clinic. However, I felt that my face looked abit puffy (like when you have water retention), which is actually one of the side effects that one may have. During my review session with Dr Wong 2 weeks later, I shared that my face was not as "V" as I hoped it would be. He told me to wait for at least a month to see the full results as the change is gradual. 2 months later? My thoughts? But here's a GIF of my ideal face shape, the 瓜子臉. Haha! Which one is more suitable for me? I have never ruled out getting Botox, but I thought I would do it only in my 40s due to fine lines and wrinkles, instead of my 20s. That was definitely new to me, but it was something I really want - To get a more defined jawline. Ever since I started making videos, I found myself being conscious of my self-perceived round face. Thought losing weight was the only way to lose those chubby cheeks, baby fats, whatever you call it. Turned out that it was partly the hard masseter muscle... And fine, fats (which the SygmaLift treatment will come in handy). Since the Botox session, I need not spend much effort to find the best angles when taking photos and videos. Family and friends noticed the difference and asked if I have lost weight as my face looks slimmer, especially from the side angle. Some were surprised to hear that botox can help in this area of concern. I believe you will do your own extensive research before you embark on any aesthetics treatments. But here are possible questions you may have. You may contact me if you have questions, but the best people to ask are always the professionals. Of which, I recommend Dr Wong – For his knowledge and quick, painless skills! The actual term for botox is ‘Botulinum Toxin’, which is a protein produced by Clostridium botulinum. Have no fear for it is NOT toxic if only small amounts are being administered. The brand, Dysport, is used at Kowayo Asthetics. (2) What is Botox usually used for? Famously used to counter fine lines and wrinkles, botox can also help individuals with excessive sweating, migraines, brow lifting. And of course, the non-surgical method for a V-shape face. (3) Is it safe? Is it painful? This has been approved by the health authorities, so no worries. Always divulge information of any allergies, previous Botox treatments, etc. Your doctor is the best person to decide if it is safe for you. I felt nothing more than a prick when getting the Botox done. (4) How long is the downtime? No downtime at all. You may resume to your normal activities immediately after receiving treatment. (5) How long till I I can see the results? You may see a slight difference within 1 week. For the full effect, it takes about 4-8 weeks, and that is when your face starts to be the slimmest! (6) How long will it last? It depends, but usually about 4-6 months, and some to 1 year. (7) Are there side effects? If injected correctly, most patients don’t have issues beyond minor redness, bruising, or swelling. If injected incorrectly, the Botox can spread too far and impact muscles it wasn’t intended to. That can cause effects like a droopy eyelid (RealSelf, 2017). A small amount of people may experience dizziness. (8) Can I apply makeup after getting the Botox? Sure! Apply your makeup, head out and party to celebrate your Victory... I mean your V-shaped face, and take more selfies! (9) Any post-treatment care required? It is best to avoid alcohol and heat/sun exposure for a few days. Try not to rub/touch/massage the treated area to avoid the toxin from ‘shifting’. Finally, try not to work your masseter muscle too much – Avoid chewing on tough meat, teeth clenching or grinding if possible. (10) Golden Question: How much does it cost? 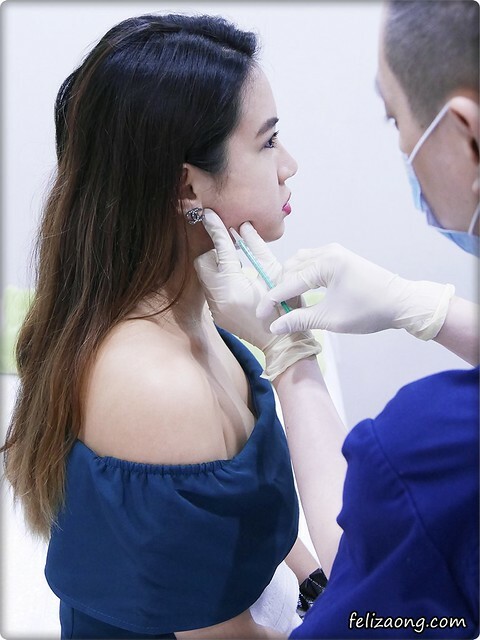 Based on information provided, each session at Kowayo Aesthetic is priced affordably from SGD500. Price may differ based on treatment area. Much thanks to Dr Wong of Kowayo Aesthetics and GotIdeas Group for this collaboration. Next up would be a blogpost for the Fillers treatment which I did as well. Stay tuned! Disclaimer: Product and service was sponsored by Kowayo Aesthetic, but all thoughts and opinion remain my own. Always seek certified professionals’ advice before undergoing any aesthetics procedures. 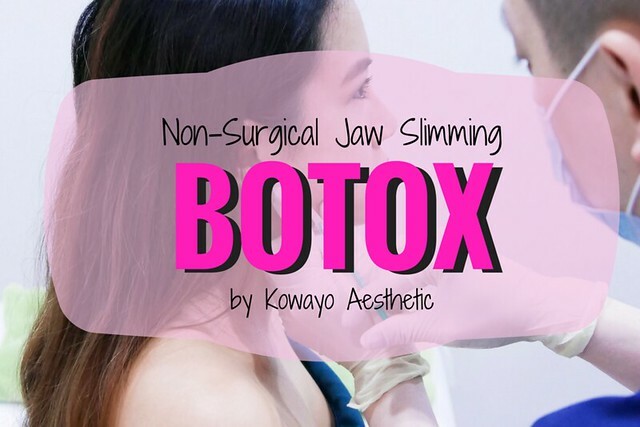 No Response to " Botox Review: Non-Surgical Jaw Slimming by Kowayo Aesthetic for a V-Shape Face "